Some days Jesus just can’t return fast enough. Though His ‘quickly’ means shortly, without delay, or by surprise (as in suddenly), aren’t there times we simply want to shout, “Surprise me already!”? When we’re circling the mountain one more time, digging the trenches another layer deeper, or are naming every rock and bush out of boredom due to less than spectacular scenery – we go not unnoticed. A great cloud of witnesses in the heavenly realm and some Jesus with skin on in this earthly realm are aware of our race. They understand when life feels like a pace car is out in front doing a controlled twenty miles per hour. Snails could get to the next gas station faster than what it feels like we’re going. But every once in a while, there’s a race to be run and won within this overall race of life we are in. That is the time for pulling out the stops and racing for all one’s worth. There’s a crown to have and hold fast. June 6, 2015. The day dawned like any other in the United States. In the field of horse racing, however, the sun rose on heightened expectations of what the day’s end would reveal. It was the Saturday of the much-anticipated Belmont Stakes, the third and final race for the coveted Triple Crown title – a victory that had not occurred for 37 years. The previous Triple Crown winner (one horse and rider winning all three of the Kentucky Derby, Preakness Stakes, and Belmont Stakes races) was Affirmed in 1978. I’ve never been to, bet on, or bellowed at a horse race. (Although I have had a desire to go to the Kentucky Derby one day – which I chalk up more to the fact that my great-grandmother hailed from Kentucky than any craving I don’t have to wear a huge, Derby-worthy hat. I look horrible in hats). Nonetheless, when our oldest daughter texted me that Saturday afternoon to ask if we had our TV on because the horses were being brought out on the Belmont track, I instantly became a grandstander. Vicariously, of course, and blessedly without the hat. The Belmont grandstand was filled with folks who (undoubtedly) had placed their bets. The talking heads of television for the pre, during, and post race commentary were full of storyline and opinion, placing phantom bets on who they thought would win the race (they would have lost, by the way). But for all the big hats and incessant chatter, there was an undeniable glory in the atmosphere as the eight horses were led from the stable out to the track for this 147th running for the Triple Crown. In those 147 years, only twelve – including the 2015 winner (but I’m getting ahead of myself…) – have accomplished the Triple Crown feat. Thirteen other horses have won the first two races, only to fall short in the third for various reasons, narrowly missing the championship title of horse racing. It was not American Pharoah’s (whose given name is misspelled) first time going for the Trifecta. He had been here before, and lost. Furthermore, in the overall scheme of this nearly century-and-a-half-long race, history was definitely not on his side. In fact, it was against him altogether. Tell that to the horse. American Pharoah and his jockey, Victor Espinoza, shot shakily out of the gate. The other seven started with more firm footing when the gun went off. 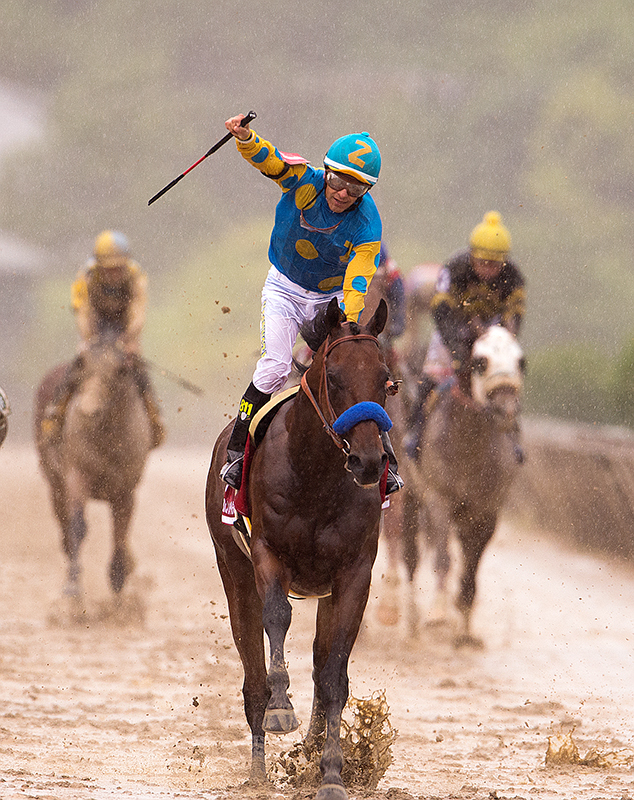 Then…American Pharoah found his sweet spot. The rest is history. 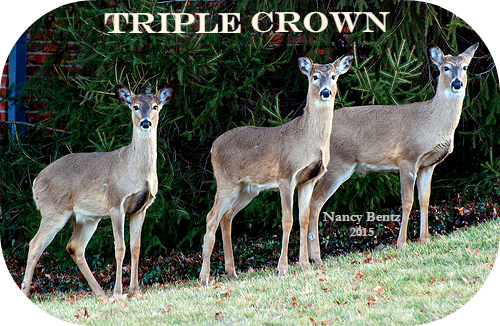 Triple Crown history. A twelfth horse and rider joined the small, elite ranks of Triple Crown winners as they led the pack of eight from start to finish, drawing away in the stretch for a flourishingly incredible history-making finish! It’s what Christ has called and enables us to do. You can bet American Pharoah spent many long hours – indeed, weeks and months – in training to win the Triple Crown as a two-year-old. Which tells me that though and because he is a thoroughbred, his powerful vim and vigor as a colt had to be keenly focused and trained into becoming one with his rider. As a result, he ran all three winning races within a five-week period. Unheard of for 37 years and why the mainline chatter was consumed with why he’d be taken out in this third race. No other horse was being ridden in these key races this close together. He was the only one whose owner was proving his prowess by continuing to race him, while the others were being rested by their owners for ‘the big one’. When we are racing, walking or standing still in the Trifecta of trouble, suffering, and responsibility, how blessedly encouraging it is to know the Lord God is our Strength, brave and invincible, making our feet like hinds’ feet as we lean into Him – like a jockey and horse becoming one in rhythm and pace. Dear Ida Mae, you are welcome. Praying that the One who makes the rough places smooth will do so for you through His exquisite nearness and loving care.